“It was very calm, no or very little wind. At 4.20-4.22 local time I observed a red upper pillar around 30 min’s before sunrise in altocumulus virga. 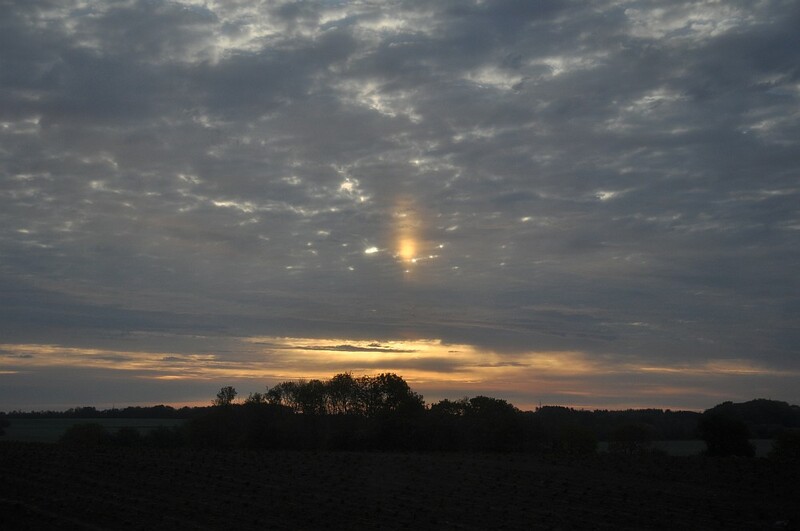 Later on the train at 5.40-5.48 local time, I observed a peculiar looking pillar in front of the altoculumus clouds, while travelling for 12 km from the town of Jelling through Gadbjerg to Give, Denmark. Sunrise had taken place approx. 60 min’s earlier. The solar elevation during the 8 minute observation increased from 5.4 to 6.5 degrees. The azimuth of the Sun changed from 57.1 to 58.6 degrees. With these data, I later looked on a map and found the lakes Mossø and Skanderborg plus the Bay of Aarhus, located at distances between 44 and 68 km, suitable for providing the reflected sunlight. I then calculated the cloud height for the reflection to be at 2.5 to 3.5 km, appropriate for altocumulus clouds. It is of note, that for the observation to hold its place as a halo, there must have been ice crystal clouds in about 3 km altitude in June. The ambient ground level temperature was circa 15 degrees centigrade according to the Danish Weather Office. A radiosonde analysis is not available any more from Denmark, but both Norderney in northern Germany and Stavanger in Norway reported rather warm temperatures at the altocumulus cloulds’ height, so this halo came as a surprise in them. This entry was posted in reflection halos, unusual halos and tagged reflection subsun, virga, water surface. Bookmark the permalink.